PR pros and community managers beware! 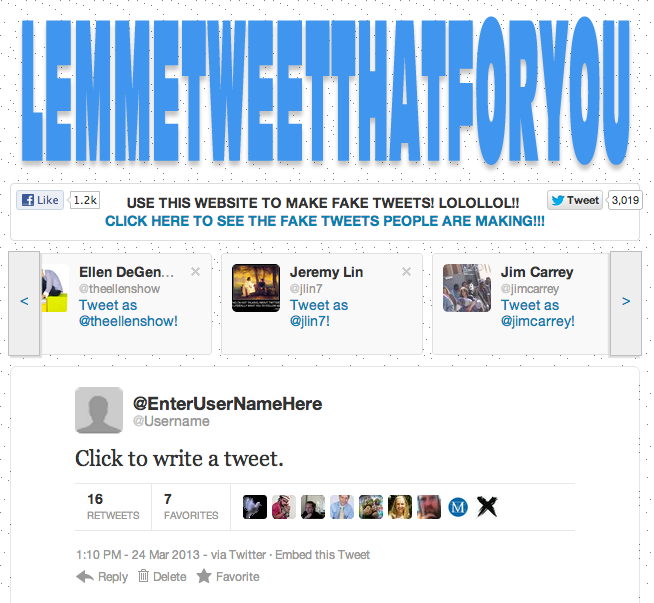 LemmeTweetThatForYou.com (LTTFY), a website that lets you create legitimate-looking fake tweets from anyone’s username, could potentially be your worst nightmare! The website came to my attention last week after someone on my timeline shared a tweet from Diddy that made it look as if he was complimenting them on a campaign that they were working on. After getting a few retweets and congratulatory messages, the person confessed and said that the tweet was generated using LTTFY. While the situation I just described was clearly just a bit of innocent fun, someone could easily use this website to start a smear campaign against you and/or your brand. In fact, this actually happens to celebrities all of the time, but up until now fake tweets have been created manually which has lead to the target getting bombarded by angry “fans,” which then turns them into a trending topic and the next day’s gossip page news. The difference with LTTFY is that the message contains all of the elements of a legitimate tweet, which could pose a real problem for brands if used with bad intentions.